Colgrass has received commissions from the New York Philharmonic, The Boston Symphony (twice), The Minnesota Orchestra, the Detroit Symphony, the Toronto Symphony Orchestra (twice), the National Arts Centre Orchestra (twice), Canadian Broadcast Corporation, The Lincoln Center Chamber Music Society, the Manhattan and Muir String Quartets, The Brighton Festival in England, The Fromm and Ford Foundations, The Corporation for Public Broadcasting, and numerous other orchestras, chamber groups, choral groups and soloists. He won the 1978 Pulitzer Prize for Music for Déjà vu, which was commissioned and premiered by the New York Philharmonic. In addition, he received an Emmy Award in 1982 for a PBS documentary “Soundings: The Music of Michael Colgrass.” He has been awarded two Guggenheim Fellowships, A Rockerfeller Grant, First Prize in the Barlow and Sudler International Wind Ensemble Competitions, and the 1988 Jules Leger Prize for Chamber Music. Among his most recent works are Ghosts of Pangea (2000) for orchestra, commissioned by the University of Miami in Oxford, Ohio, for their millennium celebration, Dream Dancer (2001) for alto saxophone and wind orchestra, commissioned by the World-Wide Concurrent Premieres & Commissioning Fund, Inc. for 25 wind ensembles, and Crossworlds (2002) for flute piano and orchestra commissioned by the Boston Symphony Orchestra and premiered with soloists Marina Piccinini and Andreas Heafliger. As an author, Colgrass recently published his first book, My Lessons With Kumi, a teaching tale and exercise book, outlining his techniques for performance and creativity. He also gives workshops throughout the world on the psychology and technique of performance, drawing on his extensive American and European studies in a wide spectrum of performing arts. He lives in Toronto and makes his living internationally as a composer. His wife, Ulla, is a journalist and editor who writes about music and art. 5:00 or 011:00 Solo amp. Piano; pre-recorded tape; boy – girl conversation; 2 0 3(B.Cl.) 1, A.Sax. – 4 4 3 1; 4Perc. Str. full score, cl., vla., pno. 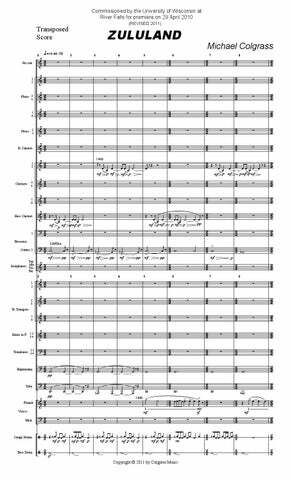 for Orchestra 22:00 3(2nd dbl. Picc., 3rd dbl. Alto Fl.) 2(2nd dbl. E.H.) 3(B.Cl., 2nd dbl. Eb Cl.) 3(Cbsn.) – 4 3 3(B.Tbn.) 1; 5Perc. Pno. Cel. Hp. Str. 15:00 2(dbl. Picc./dbl.A.Fl.) 2 2 2 – 2 2 2 1; 4Perc. Pno.(Cel.) Hp. Str. 17:00 2(dbl. Picc./dbl.A.Fl.) 2(dbl.E.H.) 3(Eb Cl./dbl.B.Cl.) 2(dbl.Cbsn) – 2 2 0 0; 3Perc. Str. 6:00 1(dbl. Picc.) 1 1 1 – 1 1 1 0; Perc. Hp. Str. 10:00 3(Picc.) 2 3(B.Cl.) 3(Cbsn.) – 4 3 3 1; Timp. Perc. Str. 30:00 Solo clarinet; 2 (fl. 1 dbl. a. fl. ; fl. 2 dbl. picc.)/1/eng.hn./b.cl./1/cbn. – 2 2 2 1; Timp. 3Perc. Cel. Hp. Str. for Harp and Orchestra 17:00 Solo harp; 2 2 2 2 – 2 2 2 0; Perc. Pno. Cel. Str. 30:00 Solo Vla. ; 3(dbl. Picc.) 0 3(dbl.B.Cl.) 3(Cbsn.) – 4 3 3 1; Timp. 4Perc. Pno. Cel. Hp. Str. 20:00 Solo Vln. (3); 2 2 2 2 – 4 3 3 1; Timp. 4Perc. Cel. Hpschd., 2Hp. Str. 36:00 Solo fl., solo pno. ; picc./2(eng.hn. )/Eb cl./1/b.cl. – 4 2 2 0; Timp. 4Perc. Cel. Hp Str. 18:00 Solo violin, cello, percussion; 2 2 2 2 – 2 2 0 0; Str. for Percussion Quartet and Orchestra 18:00 Solo percussion (4); 3(Picc.) 0 3(B.Cl.) 3(Cbsn.) – 4 3 3 1; Pno. Cel., 2Hp. Jazz bass. Str. 17:00 Solo piano (2); picc./2/e.hn./2/b.cl./2/cbn. ; 4/3/3/0; 4Perc. Cel. Hp. Str. for Harpsichord, altered Piano and Orchestra 20:00 Solo Hpsch.(db. Pno. ); 1(dbl. Picc.) 1 3(E-flat Cl., B.Cl.) 2(Cbsn.) – 2 2 2(B.Tbn.) 0; Timp. 3Perc. Cel. Hp. Str. 21:00 Solo organ; 2 2 2 2 – 2 2 2 1; Timp. Perc. Pno. Hp. Str. 28:00 Solo SATB saxophones; fl. (2) (picc. ), a. fl., ob. (2), eng.hn., cl. (2), b.cl., bsn. (2), cbsn. ; hn. (4), tpt. (3), tbn. (3), tba. ; cb., timp., perc. (4), synth., hp. 29:00 Solo SATB voices; SATB chorus (2); 2 2 2 2 – 4 3 3 1; Timp. 4Perc. Elec.Pno. Cel. Gtr. Banjo, Harmonica, Ukulele, Accordian, jazz A.Sax., jazz bass; Str. 20:00 Solo soprano, alto (2), tenor, baritone, bass voices; actor, hecklers; SATB chorus; 2(dbl. Picc.) 2 2(dbl.B.Cl.) 2 – 4 3 3 1; Timp. 4Perc. Pno. Str. 17:00 Solo soprano, mezzo-soprano, tenor, baritone, bass voices; SATB chorus; 3(Picc.) 3(E.H.) 3(B.Cl.) 3(Cbsn.) – 4 3 3 1; perc. (4), pno., cel., 2Hp. str. for Wind Ensemble and Voices 9:45 Mixed Voices; Picc., 6Fl., 2Ob., E-flat Cl., 6Cl., B.Cl., 2Bsn. (2nd dbl. Cbsn. ), S.Sax., A.Sax., T.Sax., Bar.Sax – 6Tpt., 4Hn., 4Tbn., Treble Euph., Euph., Tu., Cb. ; Timp. 6Perc. 27:00 fl. (6), ob. (3), Eb cl., cl. (6), b.cl., cb.cl., bsn. (3), cbsn., s.sax., a.sax., b.sax. ; hn. (6), tpt. (6), tbn. (4), b. tbn. (2), bar.hn. (2), tba. (2); cb., timp., perc. (4), pno./cel., hp. for Wind Ensemble 13:00 6Fl.(1dbl. Picc. ), 2Ob., 6Cl., B.Cl., Eb Contralto Cl., 2Bsn., A.Sax., T.Sax., B.Sax. ; 4Hn., 6Tpt., 3Tbn., Euph., Tba. ; 5Perc.(inc. Timp.) Synth., Pno. 25:00 fl. (6) (fl. 1-3 dbl. picc. ; fl. 5-6 dbl. a. fl. ), Eb cl, cl. (6), ca.cl., b.cl., cb.cl., cbsn., s.sax., a.sax. ; hn. (6), tpt. (6) (tpt. 5-6 dbl. cor. ), flg. hn., tbn. (4), b. tbn. (2), bar.hn., tba. ; cb., perc., pno.(cel. ), hp. (The Tower) 45:00 Minimum 18 singing/acting children; opt. mimed parts; kybd., fl.